Originally published in the New York Times. By Tina Rosenberg. Several years ago, before their protest movement was co-opted by violence, a group of young Syrians looking for a way to topple President Bashar al-Assad traveled to an isolated beach resort outside Syria to take a weeklong class in revolution. The teachers were Srdja Popovic and Slobodan Djinovic — leaders of Otpor, a student movement in Serbia that had been instrumental in the overthrow of Slobodan Milosevic in 2000. After then helping the successful democracy movements in Georgia and Ukraine, the two founded the Center for Applied Nonviolent Action and Strategies (Canvas), and have traveled the world, training democracy activists from 46 countries in Otpor’s methods. These two Serbs start with the concepts of the American academic Gene Sharp, the Clausewitz of the nonviolent movement. But they have refined and added to those ideas. In a new book, “Blueprint for Revolution,” Popovic recounts Canvas’s strategies and how people use them. “Blueprint” strains a bit too hard to be funny, but the title is no exaggeration. 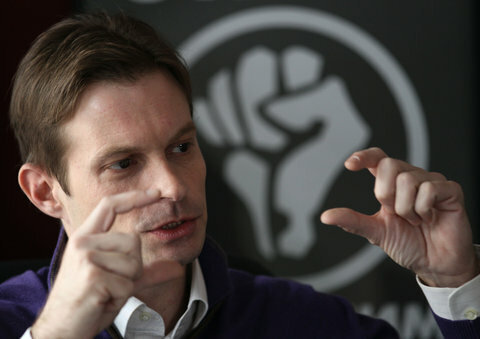 Otpor’s methods and signature — a stylized graphic clenched fist — have been adopted by democracy movements around the world. The Egyptian opposition used them to topple Hosni Mubarak. In Lebanon, the Serbs helped the Cedar Revolution extricate the country from Syrian control. In Maldives, their methods were the key to overthrowing a dictator who had held power for 30 years. In many other countries, people have used what Canvas teaches to accomplish other political goals, such as fighting corruption or protecting the environment. I met Popovic and Djinovic in Belgrade five years ago, wrote about Otpor in a book and later met them in an Asian city to watch them train democracy activists from Burma. Myth: Nonviolence is synonymous with passivity. No, nonviolent struggle is a strategic campaign to force a dictator to cede power by depriving him of his pillars of support. Just the opposite, said Djinovic: “We’re here to plan a war.” Nonviolent struggle, Djinovic explained, is a war — just one fought with means other than weapons. It must be as carefully planned as a military campaign. Over the next few days, the Serbs taught the young Syrians the techniques they had developed for taking power: How do you grow a movement from a vanload of people to hundreds of thousands? How do you win to your side the groups whose support is propping up the dictator? How do you wage this war safely when any kind of gathering can mean long prison terms, torture or death? How do you break through people’s fear to get them out into the street? Myth: The most successful nonviolent movements arise and progress spontaneously. No general would leave a military campaign to chance. A nonviolent war is no different. Myth: Nonviolent struggle’s major tactic is amassing large concentrations of people. This idea is widespread because the big protests are like the tip of an iceberg: the only thing visible from a distance. Did it look like the ousting of Mubarak started with a spontaneous mass gathering in Tahrir Square? Actually, the occupation of Tahrir Square was carefully planned, and followed two years of work. The Egyptian opposition waited until it knew it had the numbers. Mass concentrations of people aren’t the beginning of a movement, Popovic writes. They’re a victory lap. In very harsh dictatorships, concentrating people in marches, rallies or protests is dangerous; your people will get arrested or shot. It’s risky for other reasons. A sparsely attended march is a disaster. Or the protest can go perfectly, but someone — perhaps hired by the enemy — decides to throw rocks at the police. And that’s what will lead the evening news. One failed protest can destroy a movement. So what do you do instead? You can start with tactics of dispersal, such as coordinated pot-banging, or traffic slowdowns in which everyone drives at half speed. These tactics show that you have widespread support, they grow people’s confidence, and they’re safe. Otpor, which went from 11 people to 70,000 in two years, initially grew like this: three or four activists staged a humorous piece of anti-Milosevic street theater. People watched, smiled — and then joined. Myth: Nonviolence might be morally superior, but it’s useless against a brutal dictator. Nonviolence is not just the moral choice; it is almost always the strategic choice. “My biggest objection to violence is the fact that it simply doesn’t work,” Popovic writes. Violence is what every dictator does best. If you’re going to compete with David Beckham, Popovic says, why choose the soccer field? Better to choose the chessboard. The Syrians who came to the workshop, needless to say, had little influence over the strategies that were later chosen by other groups opposed to Assad. Violence eventually prevailed — with devastating results. But that is Popovic’s point: violence often brings devastating results. The scholars Erica Chenoweth and Maria J. Stephan analyzed campaigns of violent and nonviolent revolution in the last century (their book, “Why Civil Resistance Works,” uses Otpor’s fist as its cover image) and found that nonviolence has double the success rate of violence — and its gains have been more likely to last. Only a handful of people will join a violent movement. Using violence throws away the support of millions — support you could have won through nonviolence. Milosevic’s base of support was Serbia’s senior citizens. Otpor won them over by provoking the regime into using violence. Once Otpor’s leaders realized that its members who were arrested were usually released after being held for a few hours, it staged actions for the purpose of getting large numbers of members detained. Grandparents didn’t like having their 16-year-old grandchildren arrested, or the regime’s hysterical accusations that these high school students were terrorists and spies. Old people switched sides, becoming a key pillar of the Otpor movement. If there had been any truth to the accusations that Otpor used violence, the grandparents would have stayed with Milosevic. Myth: Politics is serious business. According to the Pixar philosopher James P. Sullivan, laughter is 10 times more powerful than scream. Nothing breaks people’s fear and punctures a dictator’s aura of invincibility like mockery — Popovic calls it “laughtivism.” Otpor’s guiding spirit was Monty Python’s Flying Circus, a television show its members had grown up watching, and its actions were usually pranks. Popovic writes about a protest in Ankara after the Turkish government reacted with alarm to a couple kissing in the subway. Protesters could have chosen to march. Instead, they kissed – 100 people gathered in the subway station in pairs, kissing with great slobber and noise. You are a policeman. You have training in how to deal with an anti-government protest. But what do you do now? Myth: You motivate people by exposing human rights violations. Most people don’t care about human rights. They care about having electricity that works, teachers in every school and affordable home loans. They will support an opposition with a vision of the future that promises to make their lives better. Focusing on these mundane, important things is not only more effective; it’s safer. In their Canvas workshop, the Burmese knew it was too risky to organize for political goals — but decided they could organize to get the Yangon city government to collect garbage. Gandhi wisely began his campaign of mass civil disobedience by focusing on Britain’s prohibition on collecting or selling salt. Harvey Milk failed in several campaigns for the San Francisco City Council. He won when he campaigned not on gay rights, but to rid the city’s parks of dog poop. A benefit of such campaigns is that their goals are achievable. Movements grow with small victory after small victory. Talking about the miseries of life under a dictator is also a bad strategy for mobilizing activists. People already know — and they react by becoming cynical, fearful, atomized and passive. They might be angry, but they’re not going to act on it. Anger is not a motivator. This was Otpor’s biggest obstacle. Most Serbs wanted Milosevic out. But the vast majority believed that was impossible to accomplish, and too perilous to attempt. Otpor got people into the streets by making the movement about their own identity. Young people flocked to Otpor because it made them feel cool and important. They had great music and great T-shirts, adorned with the fist. Boys competed to rack up the most arrests. Young Serbs stopped feeling like passive victims and started feeling like daring heroes. Myth: Nonviolent movements require charismatic leaders who give inspiring speeches. In a traditional party, even parties in opposition to the dictator, the leaders’ job is to make speeches, and their followers listen and applaud. Not Otpor. Its messages were tested in focus groups, and its strategies carefully planned. It was not at all anarchic on the strategic level. But on a tactical level, decentralization was critical. Otpor had only two rules: You had to be anti-Milosevic and absolutely nonviolent. Follow those rules, and you could do anything and call yourself Otpor. This kept activists feeling busy, useful and important. Myth: Police, security forces and the pro-government business community are the enemy. Maybe, but it’s smarter to treat them like allies-in-waiting. Otpor never taunted or threw stones at the police. Its members cheered them and brought flowers and homemade cookies to the police station. Even the interrogations after arrest were an opportunity to fraternize and demonstrate Otpor’s commitment to nonviolence. It paid off. The police knew that if the opposition won, Otpor would make sure they were treated fairly. During the last battle, police officers walked away from the barricades when the opposition asked them to. A dictator who can’t be sure his repressive orders will be obeyed is finished. I lived in Chile when the opposition to Augusto Pinochet made mistake after mistake; advice from Otpor might have shortened the dictatorship by years. Had the Occupy movement in the United States adopted these tactics, it might still be a relevant force. But nothing is more tragic than contemplating what Syria could have been now, had the nonviolent activists in the opposition movement prevailed — and followed Popovic’s blueprint.